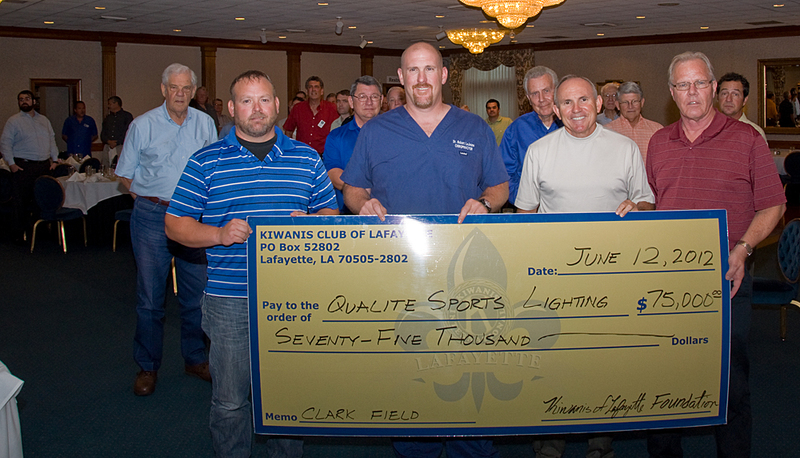 The Kiwanis Club of Lafayette Foundation presented Charles Dawson, Director of Operations for GeoSurfaces, with a check for $75,000 to be used towards new lighting equipment for the LCG Public Works/Parks and Recreation turf installation project currently under construction at Clark Field. The new lighting equipment will provide over 4 times the brightness of the old equipment at approximately 1/10 the electrical cost. Pictured above are (foreground, l-r), Charles Dawson, Director of Operations GEO-SURFACES; Dr. Bob LeJeune, Kiwanis Club of Lafayette Foundation; Greg Gautreaux, LCG Parks & Recreation Athletic Programs & Maintenance Manager and Jim Edwards, LCG Public Works Project manager - (background) Kiwanis of Lafayette membership. Wow, you all are so active, especially with supporting outdoor youth activity. Congratulations!